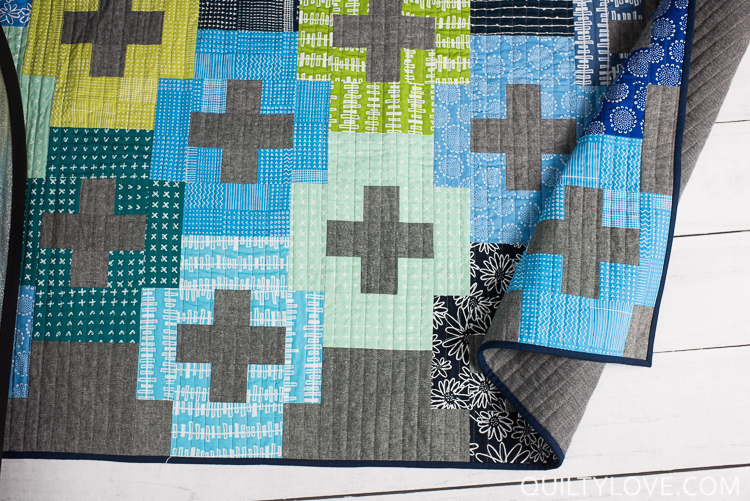 I was hesitant to post this version of this quilt since I changed the pattern for it. And of course, when I did post it, the requests for this version started coming in. I’ve went ahead and added this throw size version to the original. So now you can take your pick between the original Plus and Minus with more white space and this one. This version ends up being a little more of a scrappy version. 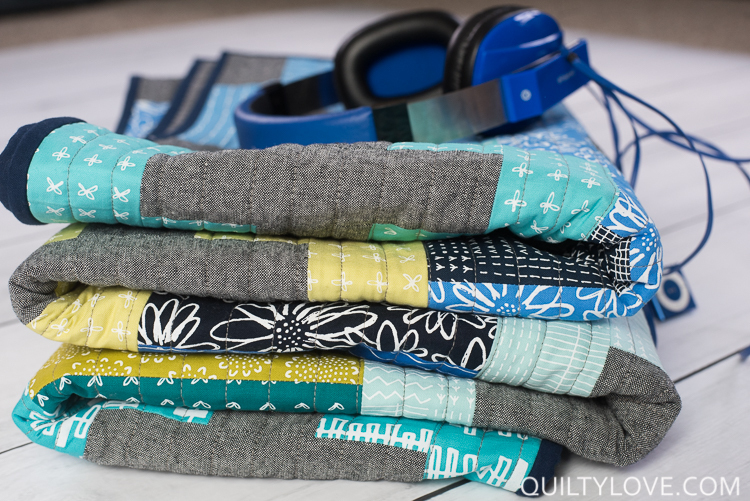 The best part is, it doesn’t require a ton of fat quarters and most of you can probably pull them from your current fabric stash. I’ve been hoarding this bundle of Blueberry Park fabrics by Karen Lewis for Robert Kaufman for quite some time. I finally used it in this Plus and Minus quilt and love how they look all together like this. I used Essex Linen in black as the background fabric for this quilt. I’m kind of obsessed with Essex Linen and use it when ever I can. It adds such nice texture and warmth to a quilt. Essex Linen can be a little finicky and scares some quilters off. I wrote about sewing with Essex linen here. I’ve never had problems with it and continue to use it in my quilts. You can really see the texture from the Essex Linen in the photo above. I love how the black Essex pairs with the cool colors of Blueberry park. 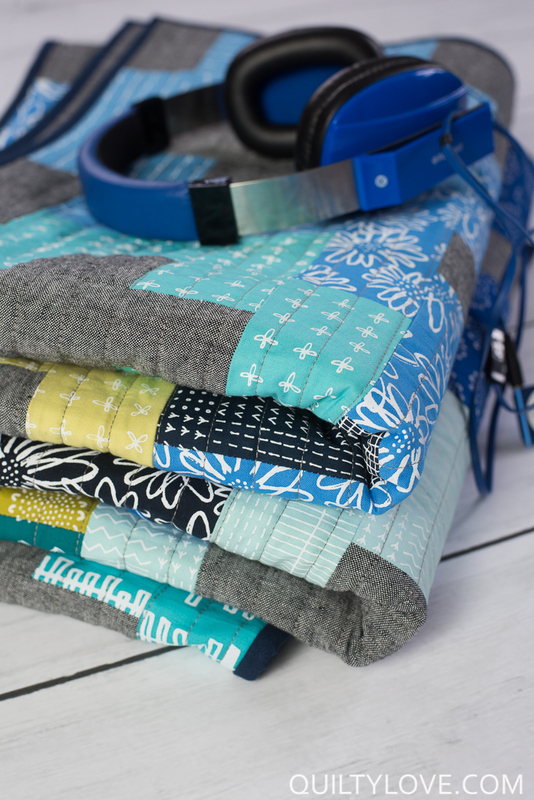 I love a good plus quilt and am always looking for ways to add a new spin to them. 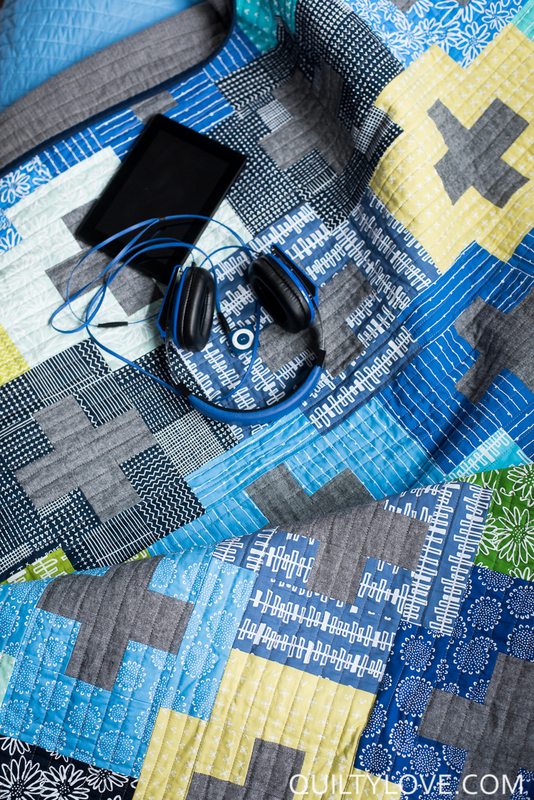 This quilt was a result of playing around with the common plus shape. 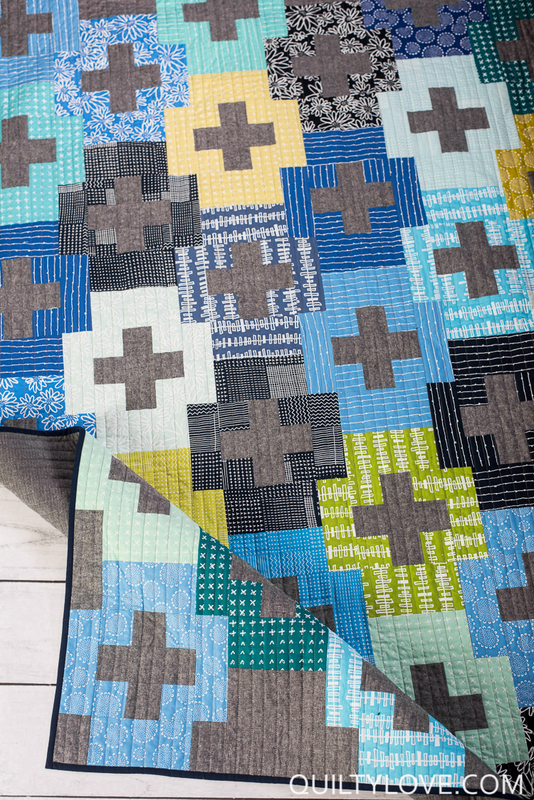 This is a good beginner friendly quilt pattern as it’s pretty easy to assemble. 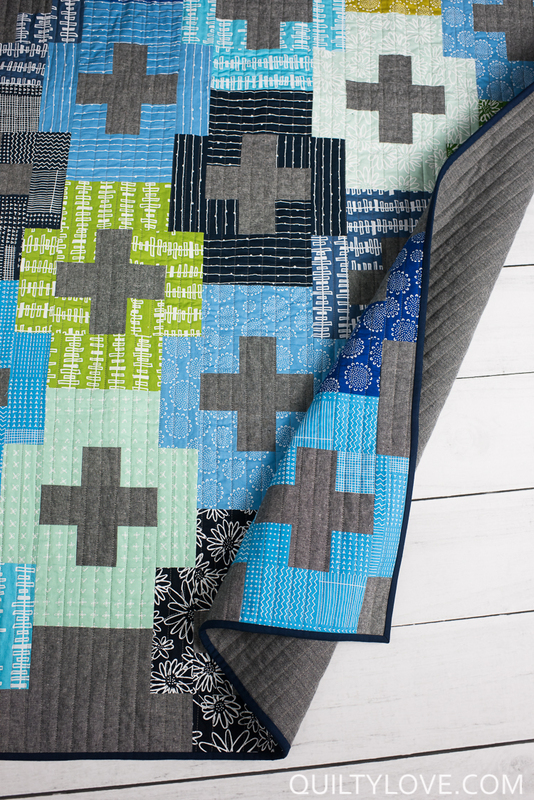 This Blueberry Park Plus and Minus quilt is quilted with straight lines using a walking foot. I like to space my straight quilting lines 3/4in apart. One inch feels too wide sometimes and I find 3/4in to be just right. This quilt was pieced and quilted on a Janome MC6700P. 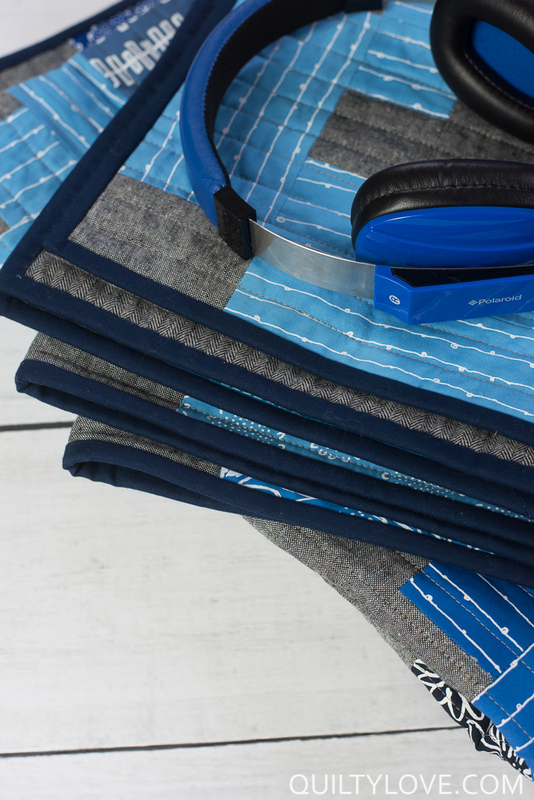 That sewing machine straight line quilts like a dream. Start with a good baste for successful straight lines. I spray baste my quilts using this spray. Be sure to tape your background down first for a better quilt baste. And when you do… I swear by this Kraft tape. Also, do use a walking foot when quilting! It makes a huge difference! 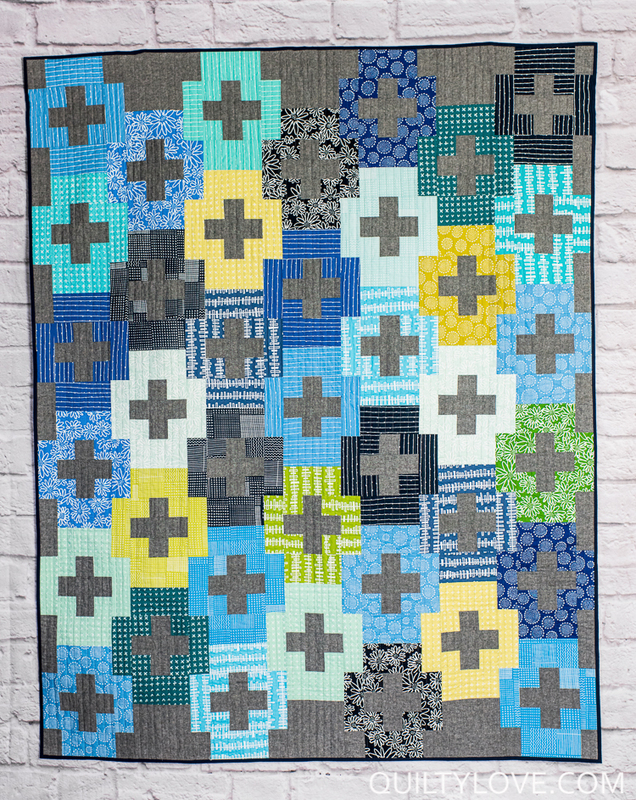 This Blueberry Park Plus and Minus quilt is quilted using a darker grey thread. I used this Connecting Threads brand. I love this thread for quilting. It’s a 50wt but on the thicker side. Perfect for pretty quilting stitches. 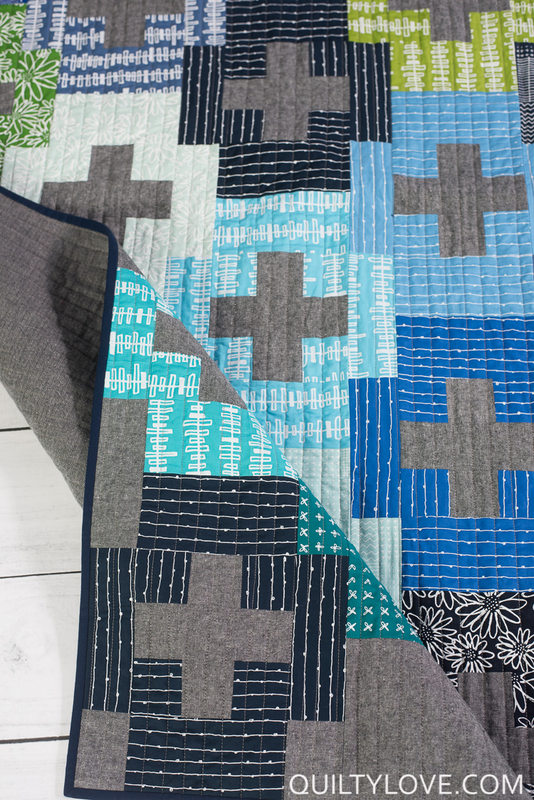 This Blueberry Park Plus and Minus quilt is bound in a solid navy. 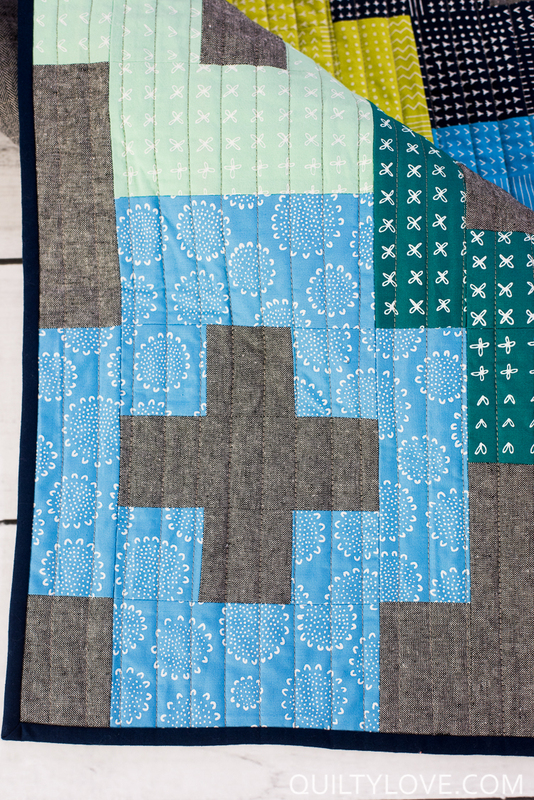 I like the simplicity of this binding and the fact that it doesn’t stand out too much from the rest of the quilt. 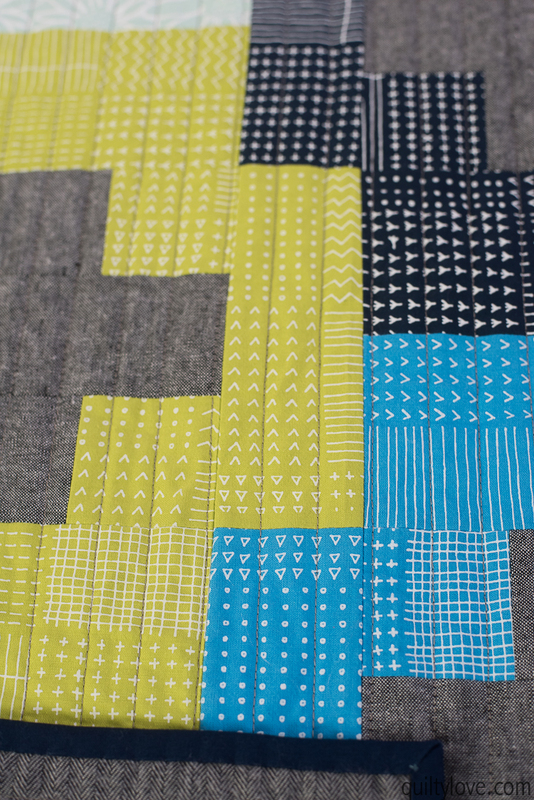 The best part of this Plus and Minus quilt…. the flannel backing! My brother asked for a warm quilt so flannel it was! 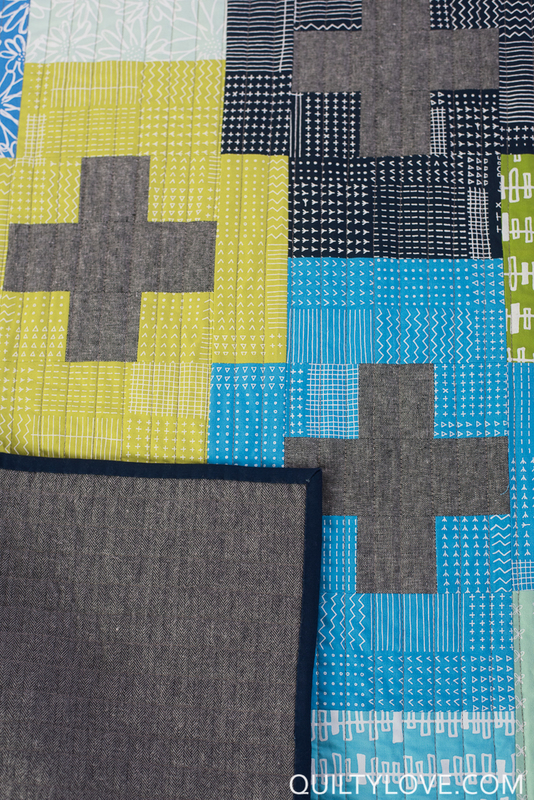 The flannel combined with the Essex Linen… that’s one warm quilt! I used this Kaufman Herringbone flannel. I like how it keeps the quilt simple and masculine. It looks like the one I used is out of stock but there are other great colors here. 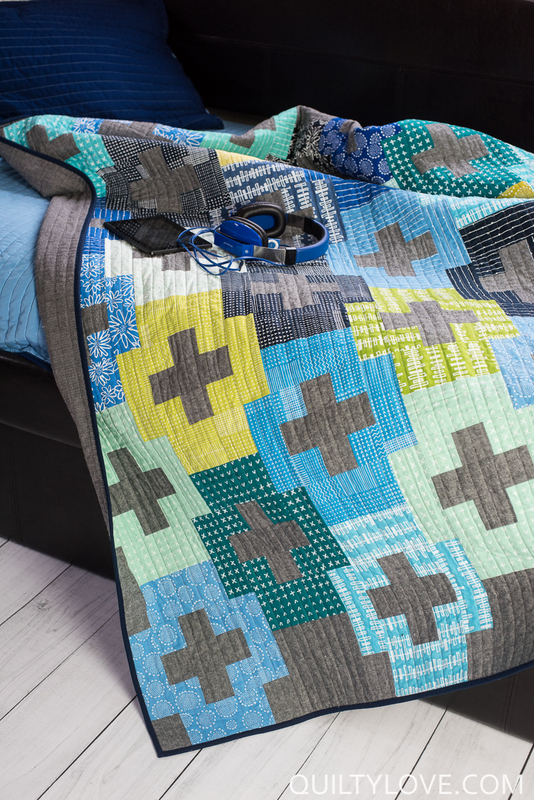 Grab your favorite fat quarter bundle and make up your own Plus and Minus quilt. 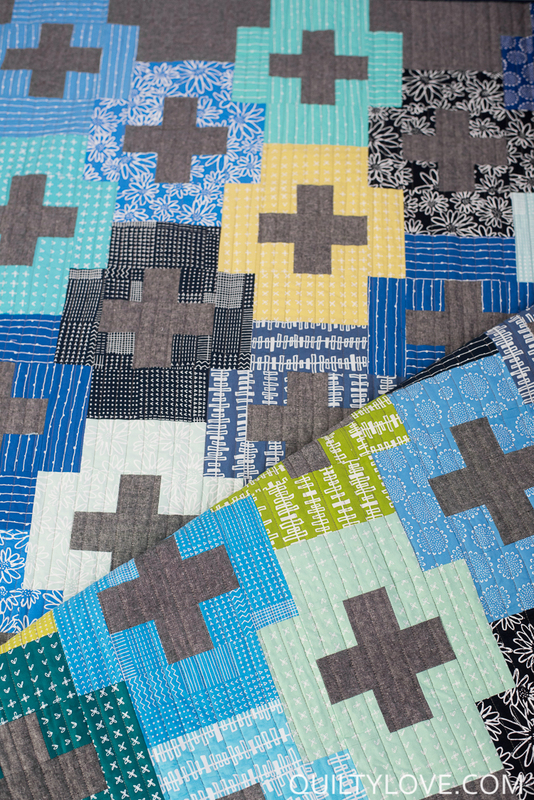 Find the pattern in the Quilty Love Shop. 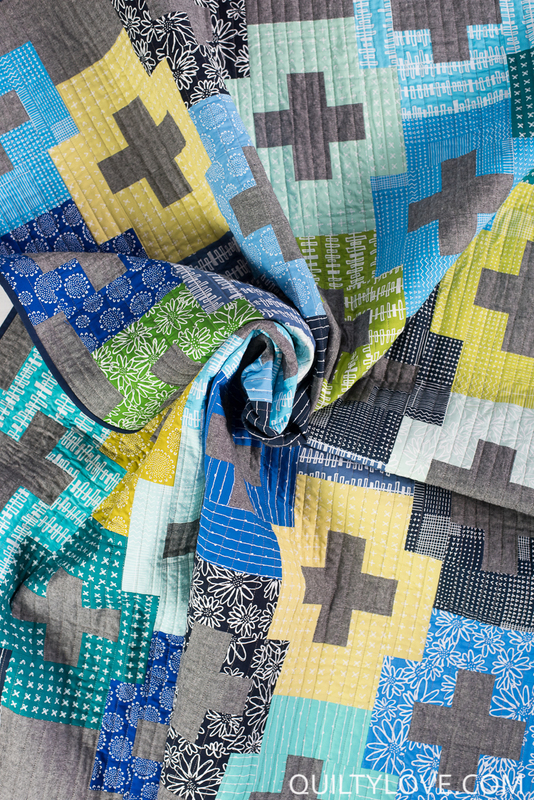 I love this quilt…I am also on the quest for more masculine quilts.. Please keep them coming. This is a beauty. I just purchased the PDF. Thanks for using my fabrics Emily and making them look so pretty!